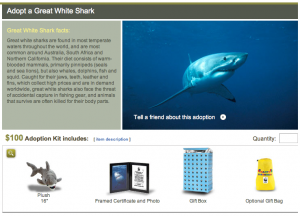 Adopt a Great White Shark through a contribution to the World Wildlife Fund Gift Center. There are three levels – $25, $50, and $100, the more money the more loot. Every adoption includes a certificate, species spotlight card, and photo. There are other animals up for “adoption” as well. The Shark Research Committee is proactive in our approach to shark conservation through education. We believe that by increasing the public’s awareness of the shark’s vital role in protecting the biosphere’s of the World’s Oceans that we can emphasize the need for immediate conservation of the more than 100 million sharks that are senselessly killed annually. Great white sharks are found in most temperate waters throughout the world, and are most common around Australia, South Africa and Northern California. Their diet consists of warm-blooded mammals, primarily pinnipeds (seals and sea lions), but also whales, dolphins, fish and squid. Caught for their jaws, teeth, leather and fins, which collect high prices and are in demand worldwide, great white sharks also face the threat of accidental capture in fishing gear, and animals that survive are often killed for their body parts.